Mann appeals for all to hear the keening of a planet whose resources are strained beneath modern consumption. In 2008, Heather Mann and her husband, Dave, downsized their home in Wisconsin, bought a boat, and began a multiyear sailing sabbatical. In Ocean of Insight, Mann relates their elucidating, sometimes harrowing, experiences, commenting upon climate change and humanity’s karmic responsibilities toward a hurting planet. Early on, Mann makes the claim that her Buddhism is not religious, and yet her text is full of active meditations and shared mantras, giving it the feeling of an ecological devotional. Between memories of disappearing islands and encounters with modern pirates, she shares classic Buddhist teachings, on topics from impermanence and attachment to regret. 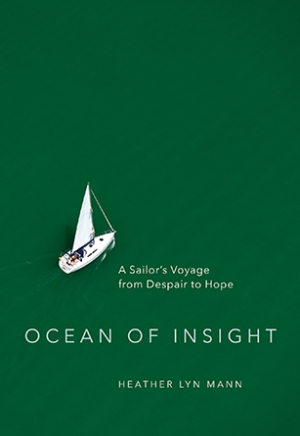 Chapters center on topics from power to mindfulness, as Mann connects spiritual teachings to the perils of sailing. Dave’s inflatable boat disappears from her sight in the midst of a storm, leading to a harrowing mayday call; the boat runs aground on a trip with their children. They race to make holiday dates with family in the Bahamas; they return to places central to their love story. Alongside all these incidents comes evidence of climate change, in the form of water levels that fall in Floridian channels, and islands swallowed up along the Chesapeake coastline. Fishing industries die; hurricanes rise. Mann, whose career focused on environmental activism, makes compelling appeals to abuse less, to be more aware, to hear the keening of a planet whose resources are strained beneath modern consumption. These threads combine in a manner that is sometimes dizzying, but the book’s clarion call is always clear, and its insistence that human behaviors need to change, soon, is sobering. Drifting through Atlantic currents and battling harsh winds alongside the Manns proves to be an illuminating experience, filled with important lessons and grand adventures.